Today reminds me of those summer days as a kid. Remember being in a pool or lake with your friends and someone challenged you to hold your breath under water? You’d go under and wait until the last possible second before rocketing upward to breathe. That’s how I feel today. The period between the end of Mini-Camp and today is brutal. But I’ve come up for air and now you can too because the Steelers arrive in Latrobe today!! Also arriving today is one Mr. Terrell Edmunds who finally signed his contract yesterday. This is good for both Edmunds and the Steelers for numerous and obvious reasons. Tweet of the Day… Speaking of Mr. Edmunds. 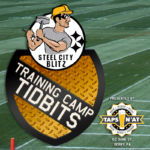 Today begins the first of our ‘Training Camp Tidbits sponsored by Taps N’At.’ Make sure you check those out for the latest on Steelers’ Camp happenings. I’m sure you saw Todd Gurley’s new contract yesterday. $45 million guaranteed. To say that the LA Rams are going “all-in” would be the understatement of the year. With Jared Goff still on his rookie deal they can afford to be this way. That will change in a couple of years though. 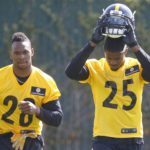 No one paid more attention to this than Le’Veon Bell who, based on his tweets, believes he was more than justified to walk away from the Steelers’ offer. If anything, it furthers the notion that this is his final season in Pittsburgh. 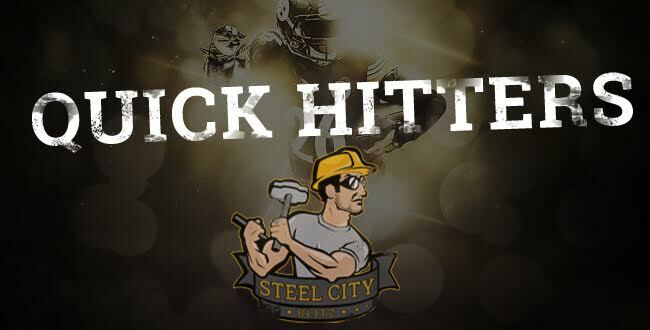 Former Steelers Arthur Moats and Mike Mitchell are scheduled to visit the Arizona Cardinals our as most of us refer to them as “Pittsburgh West.” I just can’t imagine having to replace Tyrann Mathieu with Mike Mitchell. Have to believe Mitchell wishes he took what the Steelers offered him huh?